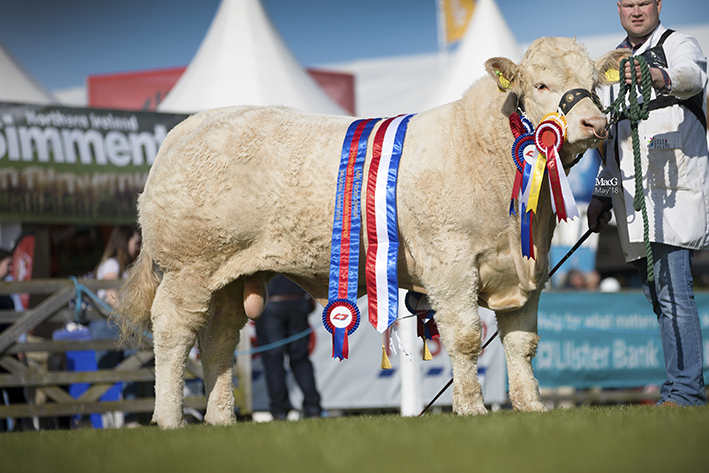 There was no doubting the quality on show for the Charolais breed this year. They took the most sought-after title of the week in the Beef rings – clinching the prestigious title of “Supreme Champions” in Interbreed Group of Five. 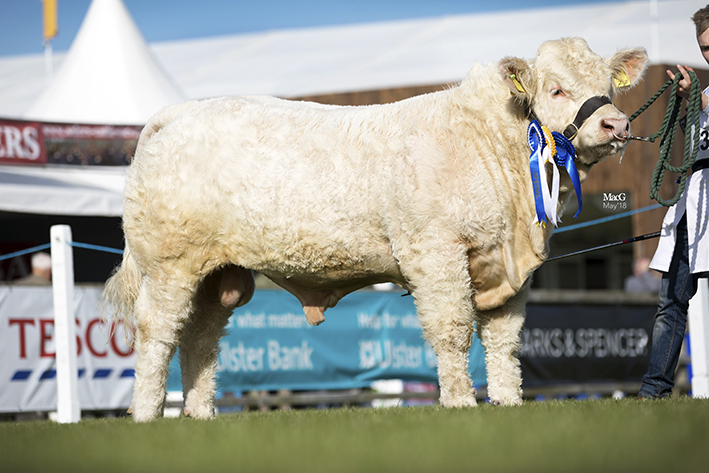 The group was led by Drumshane Mademoiselle, who had taken the title of Supreme Charolais Champion earlier in the week, also taking 2nd Reserve in the Interbreed Championship. 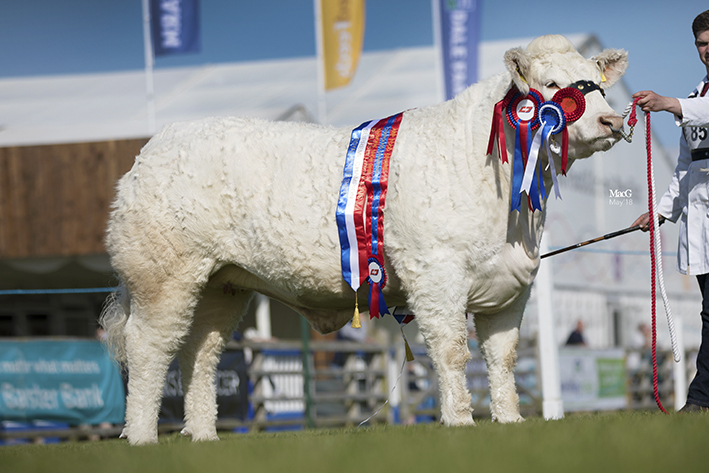 Mademoiselle is no stranger at the top of the class, as she took the Junior Championship accolades at the Royal Highland and the Yorkshire show last year. B & G Feeney from Enniscrone, Co Sligo didn’t hesitate in purchasing her from the Knox family who are originally from Co Fermanagh but now farm in Essex. 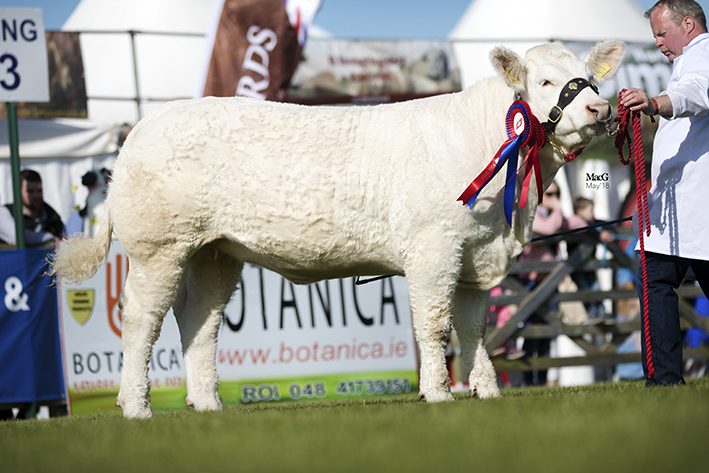 She was 2 years old in March and is sired by Inverlocky Gurka and Knox’s homebred cow Drumshane Freesia; stockman Darragh McManus for the Bostonia made sure that Mademoiselle was the crowning glory for the Bostonia team who had a superb day across the Charolais classes. 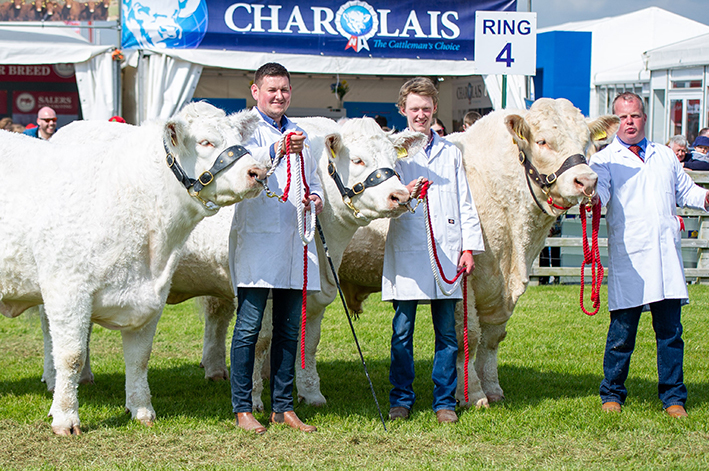 The Charolais reserve champion from the Devine Brothers Brownhill Mo, stood alongside Mademoiselle in the Group of 5. Brownhill Mo, is a July 2016 born daughter of Brownhill Indigo and sired by Maerdy Fiend. 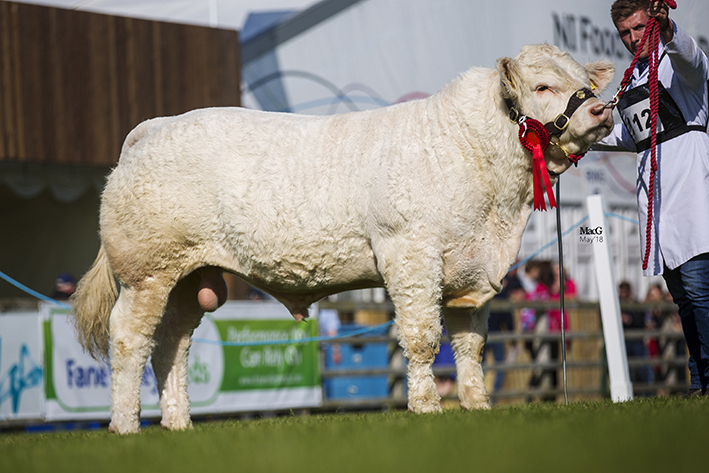 Also in the line-up was home-bred Stranagone Jones, exhibited by Robert McWilliams, sired by Blelack Digger. 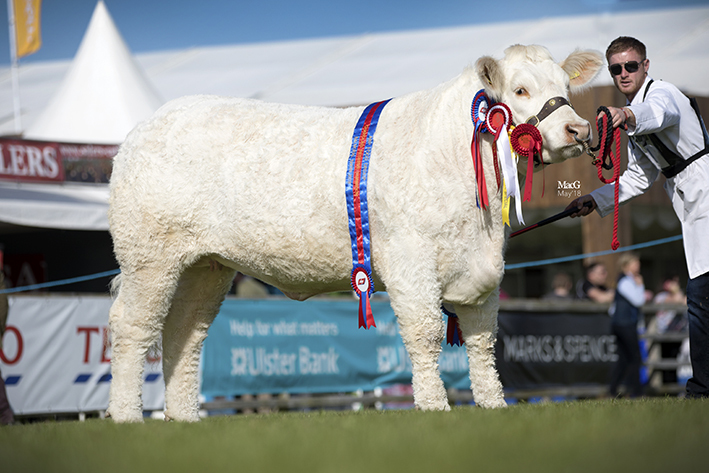 Making up the group of five was Bessiebell Millie and Bessiebell Molly sired by Newhouse Bigal exhibited by B & G Feeney; purchased from Jack Smyth after taking the Junior Championship honours at last year’s Balmoral show. The Group of Five was judged by Kay Adam, Newhouse of Glamis. 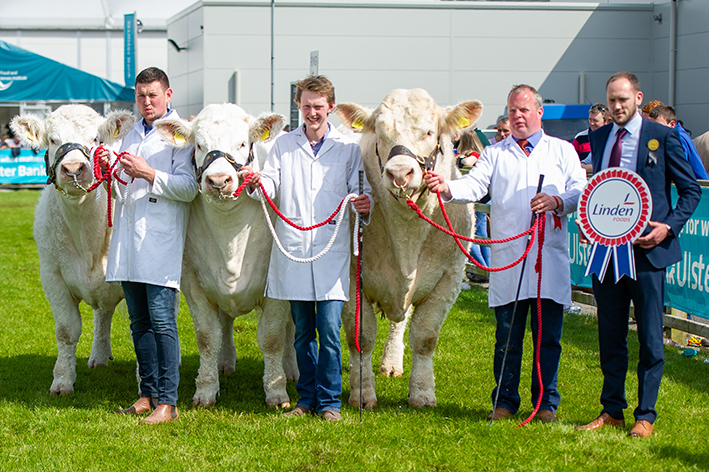 The Charolais breed also took the Reserve Supreme Championship spot in the Group of Three, with Molly and Millie coming together with Newhouse Maxamus newly purchased stockbull, sired by Maerdy Heartthrob for the Brigadoon herd of W D & J A Connolly. The Group of Three was judged by Sharon Bothwell. The Junior Champion for the day was Brigadoon Nyoka a Goldies Icon daughter bred and exhibited by WD and JA Connolly, having been awarded Junior Female champion, reserve junior female was Gallion Niceone exhibited by Edgar Johnston & Sons, sired by Alwent Goldbar. It was double honours for Jonathan Crawford in the Male Championship ring taking both the Male Champion and Reserve positions with Coolnaslee Nolan ET sired by Blathayock Justice and Coolnaslee Norton sired by Rotary Icebreaker respectively. With Nolan taking the Overall Reserve Junior Championship position. Judge in the Charolais section was Tracey Nicoll who manages the Balthayock Charolais herd in Perthshire, with husband David. 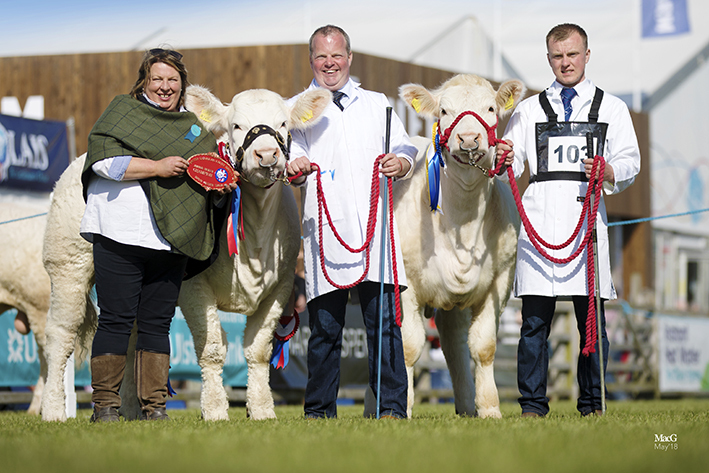 The Balthayock herd is synonymous with the breed and has had significant success across the years, David and Tracey also have their own Dounreay herd. 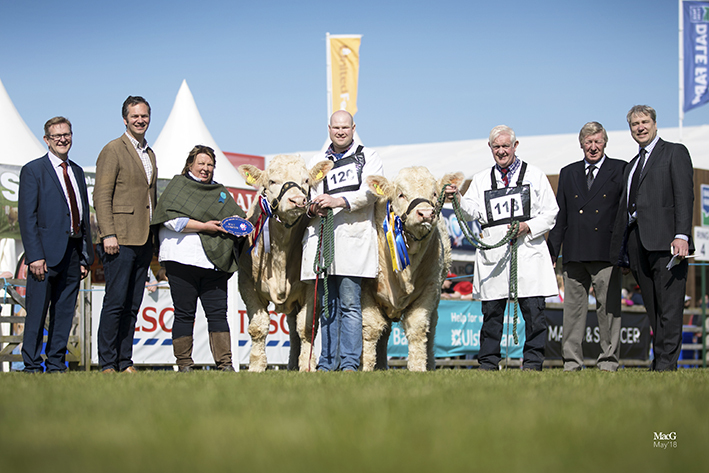 Tracey was one of 50 ladies invited to judge at the prestigious 150th Royal Ulster Agricultural Society show held for the 6th year at Balmoral Park. 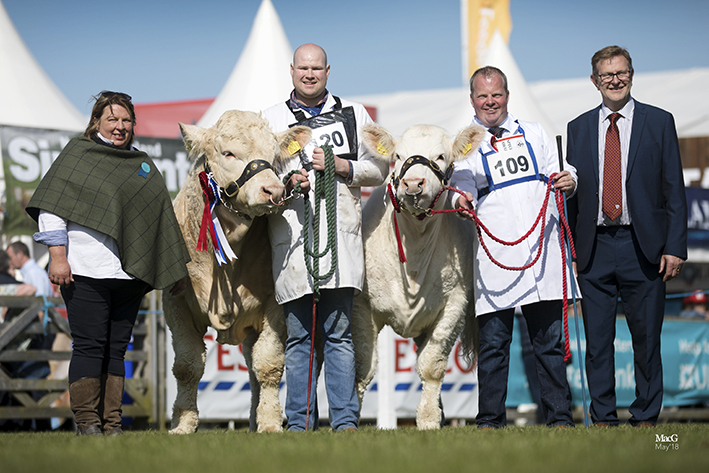 Exhibitors from across Northern Ireland put on a bumper display on the day, with entries up on last year. Alongside many of the regular faces, the NI Club welcomed Andrew McCammond and his daughter Tammy and Leanne Titterington who showed for the first time. The Bostonia herd also went on to take 3rd prize in the Best Beef Stand awards across all breeds. 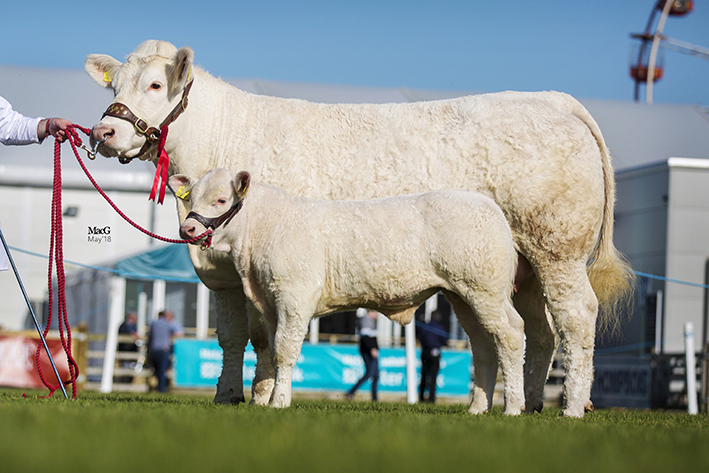 There was a huge level of interest in the Charolais breed across the four days of the show, with commentators complimenting the high levels of quality across the classes, with many breeders spending significant time as ringside and in the cattle lines. The club also attracted much discussion at the breed stand where a superb Charolais Beef display from the Corrie family. 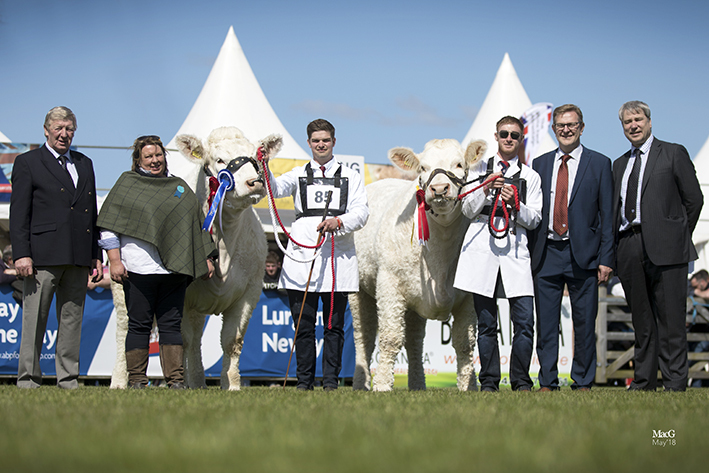 Young breeders also took to the lawns in the Young Showmanship classes with Co Mayo breeders Shannon and Aidan Kinahan and first-time shower Tammy McCammond putting on a great show with their young animals and being placed in the short lead. 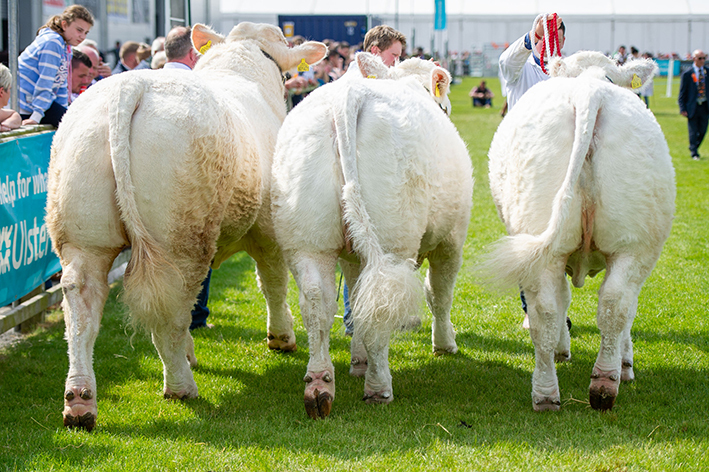 The club is indebted to the British Charolais Society the section sponsor and the RUAS; their staff and many committees and sub groups, as well as the farming press for all their hard work in rolling out the Balmoral Showcase.